Carousel Cakes is located in Nanuet, New York and is a family-owned business. The business was founded in 1965 by Martin Lefkowitz. Martin’s love for baking began at the young age of 16, and for more than 30 years, the company Carousel Cakes has sold cakes wholesale to over 1,000 different restaurants. 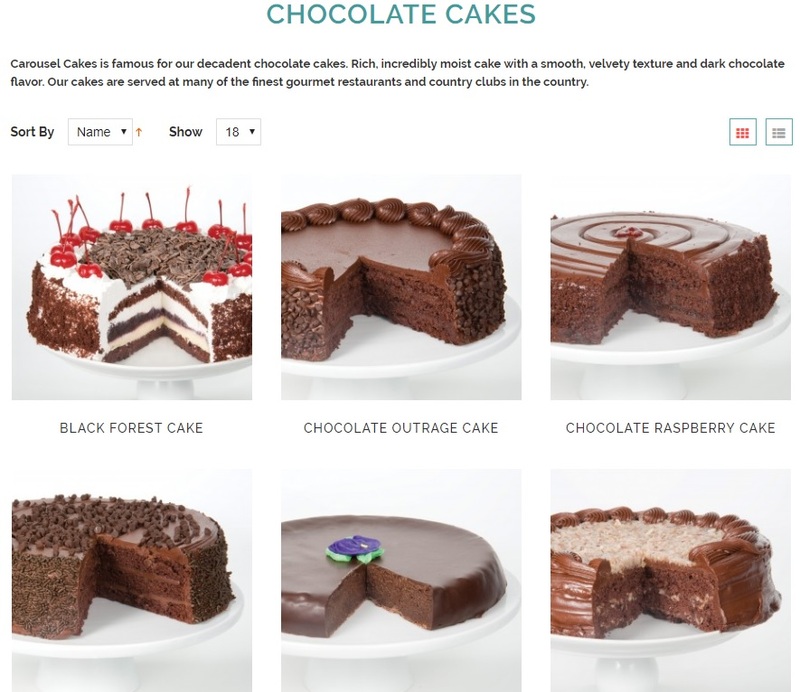 This company specializes in chocolate cakes, cupcakes, cheesecakes and other delicious desserts and have been featured on numerous television programs such as “The View” and in many magazines, including Oprah Winfrey’s O Magazine. Carousel Cakes features well over 20 different varieties of cakes and has distribution in six different states. They also have a select number of cakes that are available to those across the country and that can be purchased from their online store. What makes this cake company stand out from many is the fact that the family behind the business believes in giving back. According to their site, the company gives back by supporting their local community through bake sales, sponsorships, donations, and fundraisers. They also support national charitable organizations, such as pledging a portion of their proceeds to the American Heart Association every February. They also have a Pink Ribbon Cheesecake and Pink Velvet Cake and donate a portion of each sale of these items go to the Breast Cancer Research Foundation. The following list is only a small sampling of what Carousel Cakes have to offer its customers. 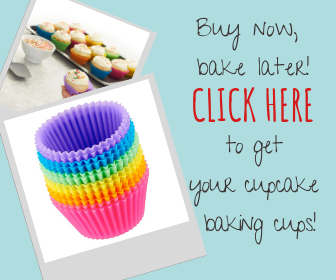 The cakes in this list were labeled as the shop’s best sellers, so if none of these piques your interest, check out the many other options that they have to offer. If that still doesn’t do it for you, then why not look into getting a custom cake? Especially if you live local to the shop! Those at Carousel Cakes fill this popular chocolate layer cake with fudge and chocolate chips. They then surround it with their thick fudge frosting before finishing it off with not only chocolate chips but sprinkles as well. Chocolate overkill? That’s not possible! This cake is a dream come true for true chocolate lovers. This cake is seven-inches round and serves between six and ten people. This cake lives up to its name and is outrageously chocolatey. This cake has three layers of moist chocolate cake filled with creamy chocolate fudge. It is then topped with their “outrageous” old-fashioned chocolate frosting and surrounded with sweet chocolate chips. Come to think of it, outrageous may not be a good enough description for this amazingly chocolatey sweet treat. This cake is seven-inches round and serves between six and ten people. 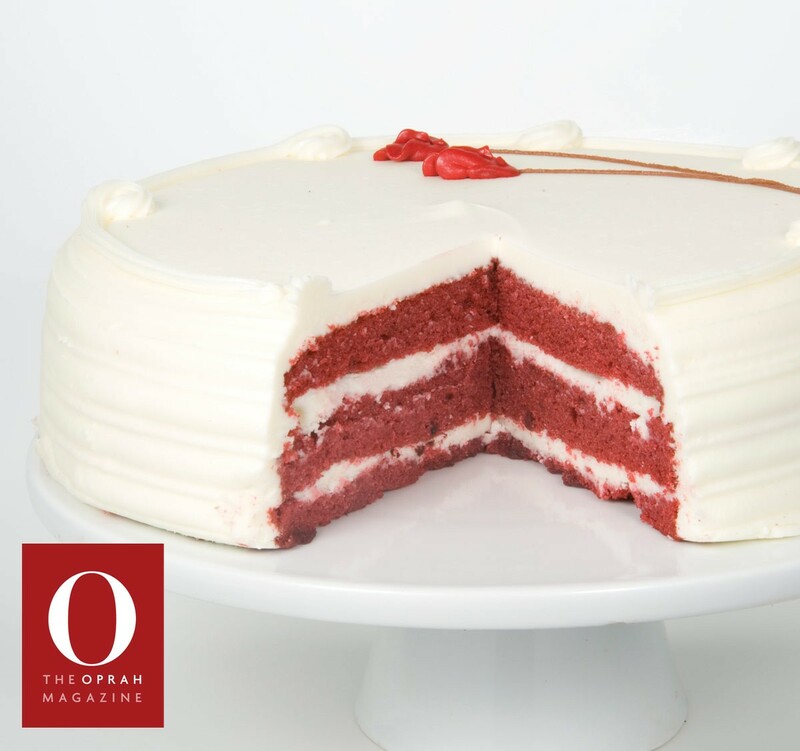 This cake is a favorite of Oprah Winfrey and even made it on her “O list.” It is a classic southern red velvet with a mild chocolate flavoring. It is topped with a pure, thick cream cheese frosting and is seven-inches round and serves between six and ten people. This is the southern classic red velvet cake dressed up for the holidays! This rich mildly flavored chocolate cake is the perfect shade of rich red and is topped with a pure, thick creamy cheesecake frosting. This cake is seven-inches round and serves between six and ten people. This moist “blue” vanilla cake has a cream cheese filling and topping and is decorated with a blue flower bud. Sure, you can go traditional and go with a red velvet cake, but this blue velvet cake takes things to a fun new level. This cake is seven-inches round and serves between six and ten people. This vanilla cake is filled with banana custard and topped with peanut butter buttercream, a layer of chocolate ganache and a peanut butter sauce drizzle. This cake is seven-inches round and serves between six and ten people. These are the cupcake versions of “Oprah’s Favorite Things” Blue Velvet Cake and Red Velvet Cake with cream cheese topping. 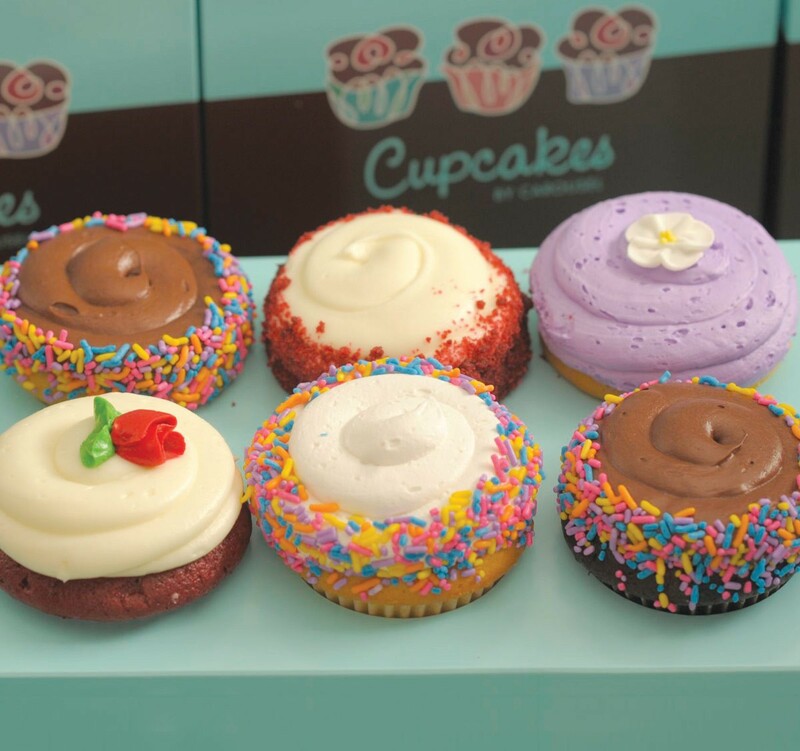 Consumers get six of each flavor for a total of 12 cupcakes. This batch of 12 cupcakes includes six of Carousel Cakes’ Best Seller cupcakes, including one of each of the following: carrot, hostess, oreo, white with pastel buttercream, red velvet, and brownie. It also includes six of their Classic flavors, including two red velvet, and one each: chocolate with white buttercream, chocolate with fudge, white with fudge, and white with pastel buttercream. This batch of 12 cupcakes includes Carousel Cakes’ Classic Collection, including one of each of the following: candy cookie dough, brownie, Oreo, coconut snowball, turtle, and cannoli). It also includes six of our Candy cupcakes including each of the following: two red velvet and one each: chocolate with white buttercream, chocolate with fudge, white with fudge, and white with pastel buttercream. This batch of 12 cupcakes includes six of Carousel Cakes’ Best Seller cupcakes, including one of each of the following: carrot, Hostess, Oreo, white with pastel buttercream, red velvet, and brownie. It also includes six cupcakes from their Candy Collections, including one of each of the following: candy cookie dough, brownie, Oreo, coconut snowball, turtle, and cannoli. 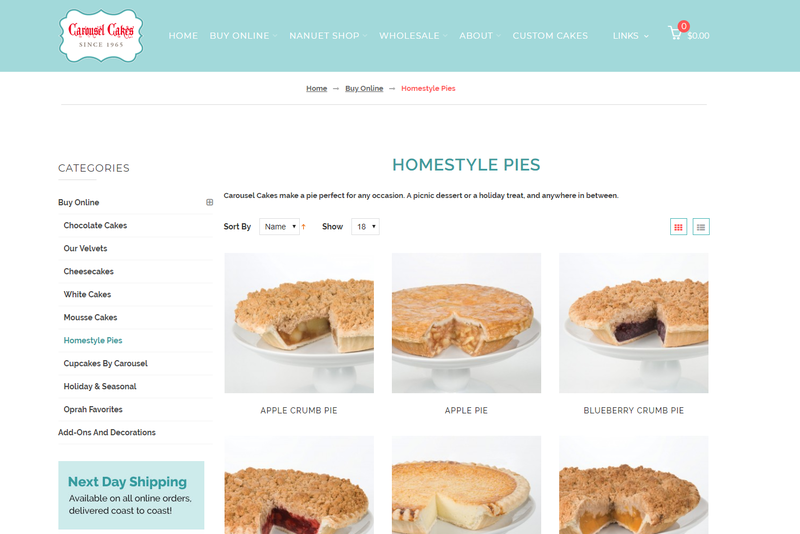 It is true that many of Carousel Cakes’ are available to be shipped to customers thanks to their online store, and in order to do so, shoppers have to create an online account. Once they do, they can start shopping through the “Buy Online” option to see what is currently available in stock. Some items, such as the holiday options, may not be in stock, so make sure to double check. For those that live local, Carousel Cakes invites you to visit their Nanuet shop to browse the selection of freshly made goodies! This way you can take them home and enjoy them freshly made instead of having to wait to have your sweet treats shipped to your home. Carousel Cakes are not only a popular local brand like Slappy Cakes, Paw Patrol Cakes, Nadia Cakes ; they are known nationwide thanks to their coverage on a variety of shows and features in many different magazines. 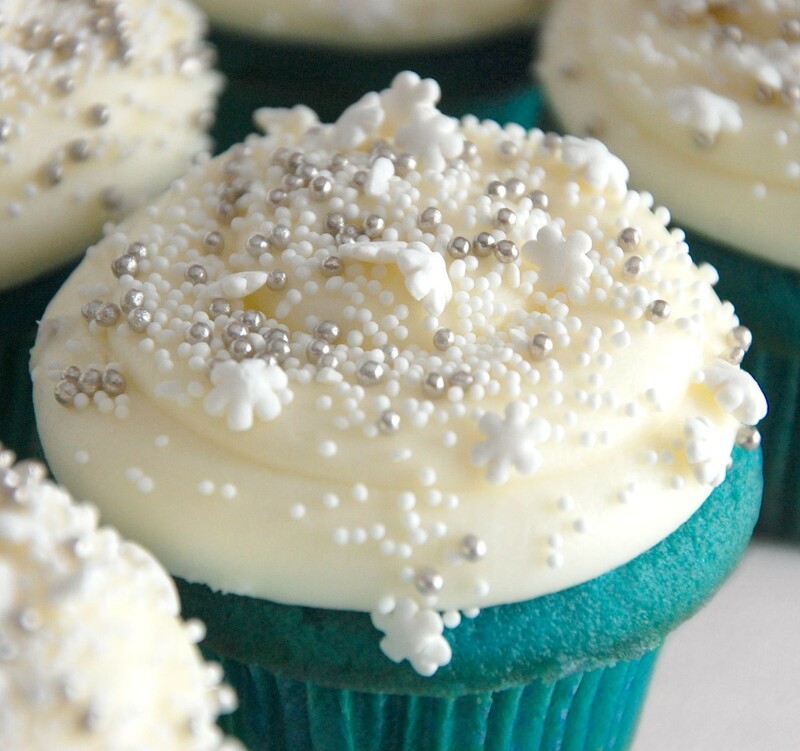 In fact, they have been featured on Oprah Winfrey’s “O list,” and a number of their cakes and cupcakes are listed as some of Oprah’s top picks, and who doesn’t love checking out Oprah’s top pick? While having a solid backing from Oprah Winfrey is cool and all, the fact that the family and business as a whole not only support their local community by giving back but also supports national charities helps to set them apart from the majority. It shows that they are not only in the baking business for the money, but because they truly care about their customers and the public as a whole. Carousel Cakes’ wide variety of options helps to give their customers plenty to choose from, despite the fact that they are known for their chocolatey goodness. What is even better is that they don’t stop there. Oh no, they also make custom cakes for a wide variety of occasions. They feature their custom cakes on their Flickr account. From birthdays, graduations, retirements and christenings, they really do a wonderful job with their custom creations. Overall, Carousel Cakes is about more than just cakes, although their love for baking and creating one-of-a-kind creations sure does show through. Their dedication to their community and higher causes take them a step above many bakeries, and their adoration and dedication to their customers take them up another notch entirely. So, if you are looking for something scrumptious or something uniquely your own for a special occasion, why not give Carousel Cakes a call and see what magic they can work for you and your get together?